My first thought was to get up at sunrise and try and find the sun, and do the same at sunset. Getting up early involves getting up early, and trying to find the sun at night can be tricky because you have to catch it before it disappears behind trees. A better, and probably more accurate way is to use a compas app on a smart phone. The position of the sun varies by latitude and time of year, but there are calculators online that will tell you the exact heading of the sun at any time of day. Find our when the sun rises and sets in your area. Type the times into a sun calculator like http://www.esrl.noaa.gov/gmd/grad/solcalc/azel.html to get the headings for sun rise and sun set. Run the compass app and rotate until you're pointing at the sunrise and sunset headings. The think orange and yellow lines show the sunset and sunrise angles, complete with a map so you can visualize. The thin orange line is the sun's trajectory throughout the day, and the light yellow region is how it varies throughout the year. We're almost on the summer solstice in this picture, so the orange line is all the way on one side. My one issue is that it makes it look like the sun is on the South side of my house, when in reality, I think it just stays in the Northern part of the sky all day. In the summer, near the solstice, the axis of the Earth points more towards the sun than any other time (about 23 degrees). This not only makes the longest day, but also puts the sun mostly in the Northern half (for my address) all day long. The sun doesn't rise and set in East and West, but rather in the Northeast and NorthWest. The take-home of all this is that one side of our house will get a lot more sun than the other. "I think it just stays in the Northern part of the sky all day"
There is a slider near the top of the page which you can use to set the appropriate time. 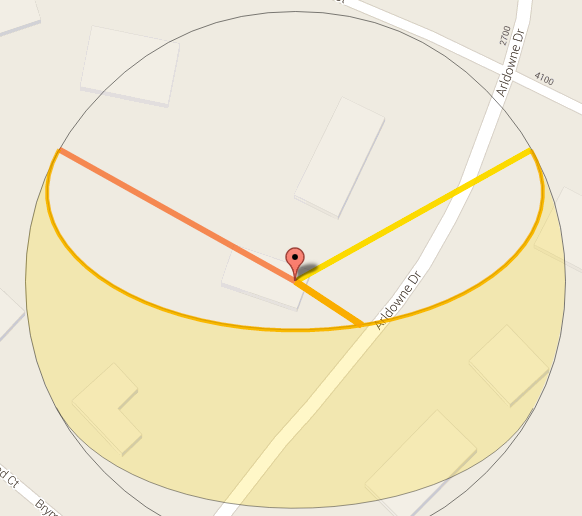 Using your link (June 27th in Tucker), bisect the circle laterally. Adjust the slide and see the sun rises and sets slightly in the north. At mid-day (about 1:45pm) the sun is *south* of you, not by much near the summer solstice. In fact, every day at mid day the sun will be south of you. What is also kind of cool, you can use the slider to identify the time that the sun passes from the northern sky to the southern sky in the morning (about 10:30am). And goes back in the evening (about 5pm). And near the winter solstice (Dec 25th). Some other cool stuff you can do with this is find out which days the sun rises/sets due east/west. Or if you are lucky, the time that the sun shines directly down your street at sunset! Also check out some cool places like "Quito Canton, Peru" and play around with the dates/times. Then check out "Baffin Region, NU, Canada" on June 21st! Cool blog! I loved the BitCoin video! I'm about to send Reddit your way!